Weekend Historical Happenings: 3/29/14 - 3/30/14 ~ The History Girl! 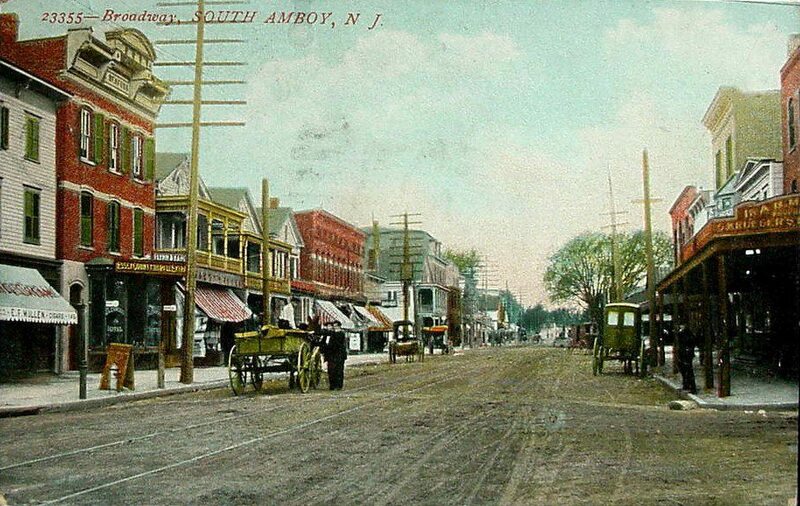 Come meet with neighbors and friends on Saturday from 1:00 - 3:00 pm to learn about historic South Amboy. 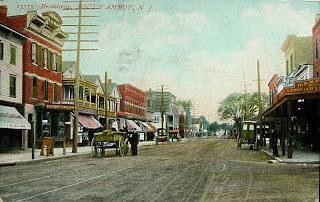 Explore local South Amboy history, old photographs, genealogy requests, historic landmarks, artifacts, a raffle, and more! Guest speaker, genealogist, and author Maureen K. Wlodarczyk will discuss her book Jersey! ...Then Again. Wlodarczyk's talk begins at 2:00 pm followed by book sales. Bring your old photographs to have them scanned on-site to be featured on their Facebook page and web site, as well as being archived for the future! Free refreshments will be served. This open house will be held at the South Amboy Senior Center, 108 South Stevens Avenue, South Amboy, NJ. 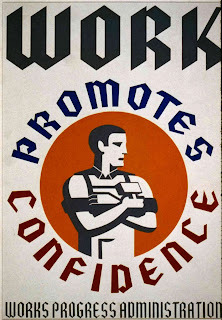 For more information, e-mail historicalsocietysa@ymail.com or visit www.southamboyhistorical.com. On Saturday, visit Fort Mott from 10:00 am - 5:00 pm for the 9th Infantry Division Historical Preservation Society's Battle for the Rhine reenactment event. This will be an interactive experience for the public with a lot of demonstrations including mine detection, marching and drilling, using a 1940s GI radio, and much more! There will be a couple of skirmishes with a German unit Fort Mott is located at 454 Fort Mott Road, Pennsville, NJ. For more information, call 856-935-3218 or visit www.9thdivision.com. On Saturday from 2:00 - 3:00 pm, the New Jersey State Museum presents a special event for Women’s History Month in recognition of the remarkable contribution of Emily Roebling, without whom the Brooklyn Bridge would not exist as it does today. She was a pioneer of Women in Engineering who taught herself bridge engineering in order to direct the workers at the construction site when her husband Washington became home-bound after a workplace accident and was unable to deliver instructions himself. Emily became his envoy for the final eleven years of the construction and was the first woman to address the American Society of Civil Engineers. She was truly a woman ahead of her time. Saturday's special presentation on Emily Roebling is derived from script Roebling: The Story of the Brooklyn Bridge by Mark Violi of Hamilton, NJ. It is produced by Theater To Go and is directed by Ruth Markoe of Lawrenceville, NJ. It features Sarah McIlhenny of Browns Mills, NJ and Jennifer Huckleberry of Columbus NJ. An original musical score composed by Frank Grullon of NYC especially for Roebling The Story of the Brooklyn Bridge will be featured as well. This special free event is sponsored by the New Jersey State Museum. It is a prelude to the full theatrical production of RoeblIng: The Story of the Brooklyn Bridge, to be presented by Theater To Go from May 16 - 25, 2014 at the New Jersey State Museum. Saturday's program will take place in Theater at the New Jersey State Museum, 205 West State Street, Trenton, NJ. Admission is Free. For more information and to reserve tickets for both events, visit www.roeblingplay.com. On Saturday, visit Historic Longstreet Farm in Holmdel and make an old fashioned kite! Hope for wind! This free event runs from 12:30 - 2:30 pm. Historic Longstreet Farm is located at 44 Longstreet Road, Holmdel, NJ. For more information, call 732-946-3758 or visit www.monmouthcountyparks.com. Enter the Ford Mansion through the eyes of Mrs. Ford, her daughter Elizabeth, Martha Washington, and the female servants. Explore the roles each of these women played in making General Washington's headquarters more like home. 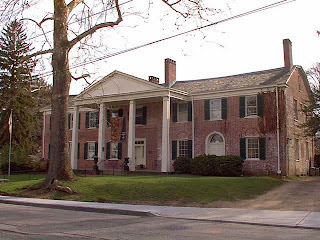 Programs at 1:00, 2:00, and 3:00 pm at the Ford Mansion, within Morristown National Historical Park, Morristown, NJ. Cost: $4 per adult. For more information, call 973-539-2016 ext. 210 or visit http://www.nps.gov/morr. The Plainfield Public Library's Local History, Genealogy & Special Collections Department invites you to "Finding Out More About Your Genealogy Through DNA Testing" on Saturday from 10:00 am - 12:00 noon at the library. Learn how to uncover your ethnic origins. Teresa Vega, a member of both the New York and New Jersey Chapters of the Afro-American Historical and Genealogical Society, will speak about DNA testing and genealogy research. Ms. Vega has a background in cultural anthropology and is the author of a genealogy blog. This informative program will be held at the Gallery Room on the lower level of the library. The Plainfield Public Library is located at 800 Park Avenue, Plainfield, NJ. This is a free event. For more information, call the Local History Department at 908-757-1111, ext. 136 or visit www.plainfieldlibrary.info. Twin lambs, newly hatched chicks, and baby pigs are among the dozens of new faces you will find at Howell Living History Farm these days, as well as a few colonies of bees. Visitors to the 130-acre working farm will be able to meet these animals up close during the farm’s annual New Faces Day. Throughout the day, farmers will be present to introduce visitors to babies born this spring, as well as to other animals. Walk-in visits to the hen-house, sheep barn, and pig pen will be permitted. Visitors to the main barn will be able to meet the farm’s workhorses and oxen. On Sunday afternoon at 2:00 pm, visit the Museum of Early Trades and Crafts to hear Donald Sherblom, PhD present "A Loyalist Farmstead in a World Turned Upside Down." Learn about the Vought family and the new roles played by the Vought women during the Revolutionary War. Admission is $7 for nonmembers, $5 for seniors and students and $3 for members. Advance registration recommended. Call 973-377-2982 to register. The Museum of Early Trades & Crafts is located at 9 Main Street in Madison, NJ just two blocks from the Madison train station. For more information, please call 973-377-2982 x10 or visit www.metc.org. The Hamburg Historical Society is hosting a PowerPoint presentation by Dr. Peter Lubrecht entitled "Germans of New Jersey" on Sunday afternoon at 2:00 pm at Hamburg Borough Hall, 16 Wallkill Avenue, Hamburg, NJ. Social time and a book signing will follow the presentation. Refreshments will be served. 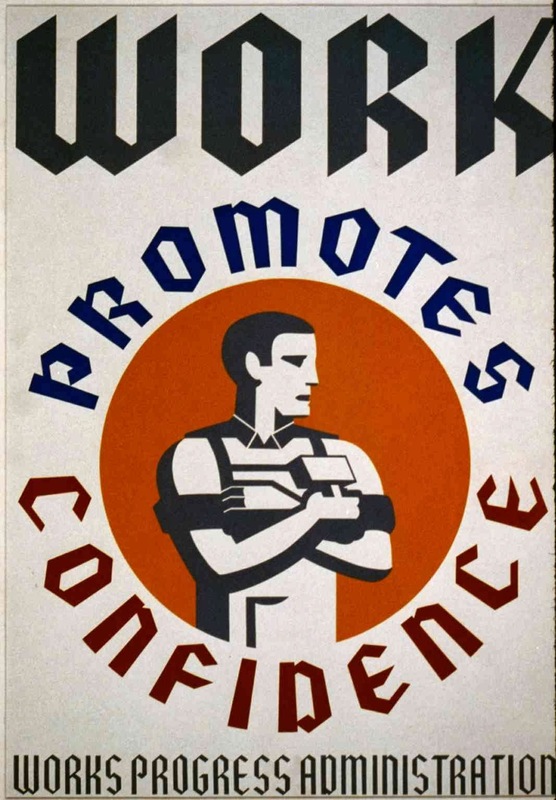 The public is invited, and new members are welcome. Admission is free. Reservations are not required. For more information, contact Dr. Marion Wood by calling 973-827-5478 or e-mail drwoodme@gmail.com. 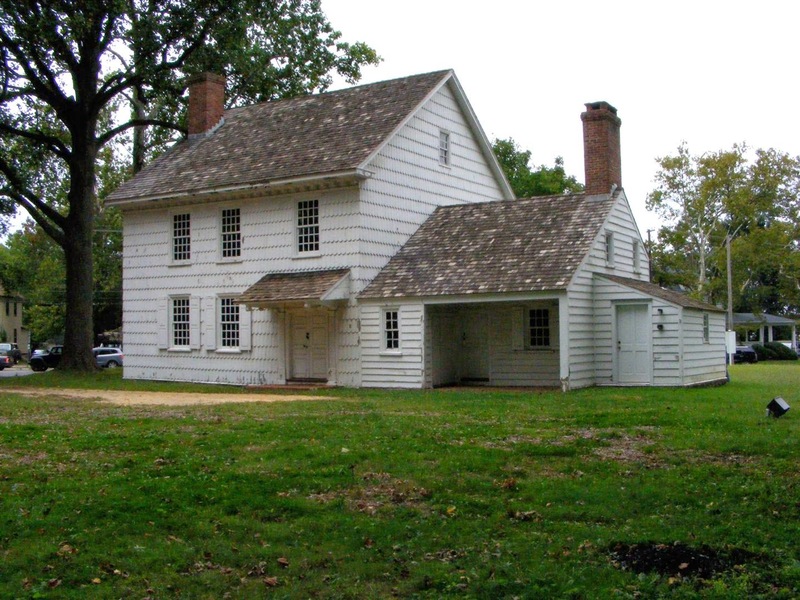 Monmouth County Historical Association invites the public to enjoy Open Hearth Open House at the Covenhoven House on Sunday from 12:00 noon - 4:00 pm. Come and observe eighteenth-century style cooking over the blazing open hearth. Visitors will see food being made from authentic "receipts" provided by our hearth cook, Mr. Glenn May. This Open Hearth program will feature cream toast, gingerbread with orange glaze, apple pie from dried apples, beef vegetable soup, raspberry pomegranate tea, and ginger snaps. As you take a guided tour of the house stories of families living the Colonial Life will be told. The tour will include a demonstration of how tea was served in the eighteenth century. Guided tours of this preserved landmark house, built in 1752 for William and Elizabeth Covenhoven will be provided. The Covenhoven House later served as headquarters for British General Sir Henry Clinton before the Battle of Monmouth in June of 1778. Admission is free - bring the family. The Covenhoven House is located at 150 West Main Street in Freehold near the Route 9 overpass. Parking is available at Grace Lutheran Church at the corner of West Main Street and Business Route 33. For more information, call 732-462-1466 or visit www.monmouthhistory.org. Did Tempe Wick really hide a horse in the Wick House? Hear the legend and find out the truth as you explore the Wick House and look for potential hiding spots. Program at 1:30, 2:30, and 3:30 pm at the Wick House in Jockey Hollow, within Morristown National Historical Park, Morristown, NJ. Cost: Free. For more information, call 973-543-4030 or visit http://www.nps.gov/morr. Macculloch Hall Historical Museum is celebrating the 350th anniversary of New Jersey with book signings by authors whose work explores aspects of the state's history. On Sunday, they welcome Cynthia B. Martin who will be available to sign and sell books to museum visitors during touring hours from 1:00 - 4:00 pm. 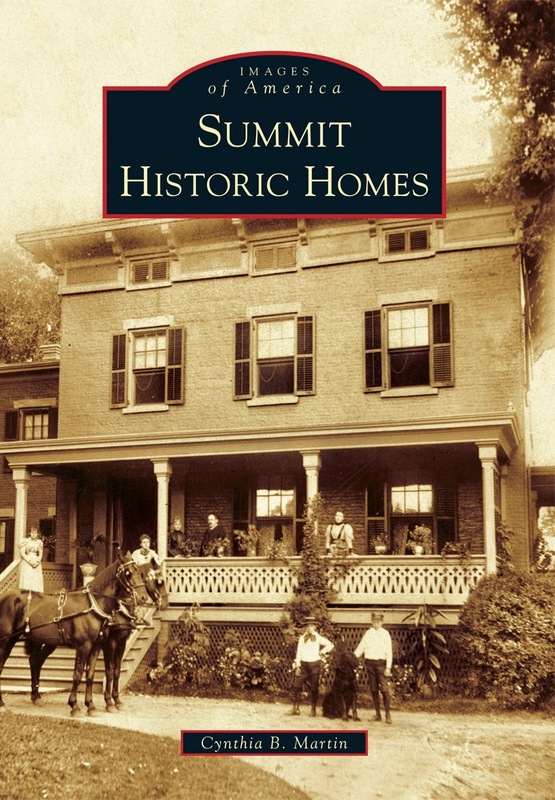 Ms. Martin is the author of Summit Historic Homes which includes more than 200 vintage images of the magnificent homes of Summit, New Jersey. Originally sought out by city dwellers as a refuge from the tribulations of urban life, Summit developed from a bucolic rural spot in 1836 to a fully established suburb by 1940. The town's growth was intrinsically tied to the development of the railroad and the convenience of the commute it offered to nearby New York City. The houses constructed during these years reflected their owner's wealth, social standing and aesthetic sensibilities, and exemplified the trends of their times. Some of these houses served as summer residences; others as primary dwellings. Some were designed by well-known architects; others by local talent. Many of these residences are still standing, although some have been altered or even demolished to suit modern lifestyles. The book contains rarely seen before images of residences designed by local architects. A New Jersey native, Cynthia B. Martin grew up in Madison. Since 1988, Martin, her husband and their three children have lived in one of Summit's historic houses. Martin's enthusiasm for Summit is reflected in her active participation in the life of the community. She was elected to three terms on Summit's Common Council from 1997-2006 and has served on the boards of many local organizations. Currently she is a volunteer and trustee of the Summit Historical Society and serves as Chair of the Summit Area YMCA Board of Trustees. An art history major at Smith College, Martin has a longtime interest in American decorative arts and architecture. She followed up on this interest by receiving a Certificate in Historic Preservation from Drew University in 2010. The author's profits from sales of the book are being donated to the Summit Historical Society. The Cranford Historical Society presents "Early American Art Glass: Tiffany, Quezal, Durand" with Vic Bary on Sunday at the Crane-Phillips House Museum from 2:00 - 4:00 pm. The program begins at 2:15 pm. Art glass, hand-blown vases and lamp shades made for decorative purposes, flourished from the turn of the 20th century to the Great Depression. Its earliest incantations were influenced by the Art Nouveau movement, and sought to mimic natural forms, such as the jack-in-the pulpit, gourds, and various flowers. It also drew from the forms used by historical cultures and from recent discoveries of ancient Egyptian burial sites. Louis Comfort Tiffany (1848-1933) was the earliest and most prominent force in the production of American art glass, aided by an artistic eye and a family fortune. Individuals who were either glass mixers or glass blowers for Tiffany would be central to two of the great successor American art glass firms - the Quezal Art Glass and Decorating Company, and the "fancy shop" Victor Durand Jr.'s Vineland Flint Glass Works. Cranford Historical Society Trustee and art glass collector Vic Bary will lead an historical and visual tour through the output of these three important American art glass firms with copious visuals and a few examples. The Heritage Trail Association and Somerset County Historical Association are jointly sponsoring a free, open public program for the county’s history community. The event will be an opportunity to meet representatives from many of the county’s history organizations, learn more about historic resources available in the county, and find out about several recent historic preservation initiatives. Mr. Green is an historian and collector of military arms and equipment. He is the Borough of West Long Branch’s Historian, life member of the Long Branch Historical Society, and caretaker of an extensive collection of original military items spanning from mid-19th century to WWII. The free event will be held at historic Van Horne House, 941 East Main Street, Bridgewater, NJ, just across from the Patriots Ballpark. Free parking is available behind Target and at the ballpark. Space is limited and reservations are required. To register and for more information, call 732-356-8856 or visit www.heritagetrail.org. The Burlington County Historical Society is pleased to present "New Jersey Baseball during the Civil War Era, 1855-1870" by John Zinn on Sunday from 2:00 - 4:00 pm. Join us for this presentation and learn about the start of baseball in New Jersey, the impact of the Civil War on the development of the sport, and how New Jersey soldiers took the game with them to the front. John Zinn is the author of "The Mutinous Regiment: the Thirty Third New Jersey in the Civil War," and "The Major League Pennant Races of 1916." A question and answer period and light refreshments follow the talk. $5 per person. Please RSVP to burlcohistsoc@verizon.net. This talk will be held at the Society's Corson Poley Center with entrances at 454 Lawrence Street and behind 457 High Street in Burlington, NJ. For more information, call 609-386-4773 or visit www.burlingtoncountyhistoricalsociety.org. On Sunday at 5:00 pm in Lambert Castle (home of the Passaic County Historical Society), the William Paterson Department of Music will present its Spring Recital. This recital will showcase a number of performers, both faculty and students from William Paterson's Department of Music, on a number of instruments including the piano, brass and woodwind. Admission to the concert is $15 or $10 for students with a valid student ID. Seating is limited and no reservations will be taken, so please arrive promptly. This recital marks the opening of this year's Lambert Castle Concert Series. Featuring local musicians and a variety of musical genres, all concerts are performed in the beautiful atmosphere that is Lambert Castle. Lambert Castle is located at 3 Valley Road, Paterson NJ. For more information, call 973-247-0085 or visit www.lambertcastle.org. Traveling Literary Theater member Maggie Worsdale will entertain guests at the Ocean County Historical Society, 26 Hadley Avenue, Toms River, NJ on Sunday at 2:00 pm as she shares the intriguing tales of happiness, love and loss, fashion, and scandal in the lives of First Ladies after Martha Washington. Fans will recognize the singing accomplishments of Ms. Worsdale from prior performances and will delight in hearing both colonial and original songs in her show. Refreshments will be served. Admission is free. Make your reservations today for an enjoyable afternoon by calling 732-341-1880. The Bergen County Historical Society celebrates the Lenape New Year, Chwame Gischuch (Shad Moon), at Historic New Bridge Landing on Sunday from 1:00 - 5:00 pm. The first Dark Moon after the Long Moon marks the arrival of Chwame gischuch, the Shad Moon, and the New Year of the ancient Sanhicans and Minisinks, locally known as the Hackensacks and Tappans. Native peoples returned from their winter villages, gathering at the narrows of the great streams, in places such as Acquackanonck (Garfield) and Aschatking (New Bridge), to set their fykes and weirs and catch smelt and later shad as these fish ran up the rivers in great numbers. At 1:30 and 3:30 pm, historian Kevin Wright, author of 1609: A Country That Was Never Lost, will present an illustrated talk in the Steuben House, entitled "The Peach War of 1655" as part of the Bergen County Historical Society's yearlong commemoration of the 350th anniversary of New Jersey's founding and the end of New Netherlands in 1664. In keeping with the Lenape New Year, his talk explores a little known chapter in Bergen County history, illuminating the relationship between its Native American inhabitants and Dutch settlers. The talk reviews the events of September 15, 1655, when 64 canoes, carrying 500 warriors from ten Indian tribes, landed on the western shore of Manhattan island, instigating a destructive conflict misnamed the Peach War, which resulted in the death of 50 colonists; the capture of another hundred, mostly women and children; the burning of 28 farms, together with 12,000 schepels of grain, and the loss of nearly 600 cattle. It is the seldom told story of how rivalries among native societies and the competition to supply firearms among European colonial powers, expressed through diplomacy and warfare, turned eastern North America into an arena of international conflict in 1655. It is also a story of early attempts to regulate firearms and liquor and of the exchange of arms for hostages. Selections from the Bergen County Historical Society's collection of local Native American artifacts will also be displayed. Throughout the afternoon, Bob Wills, of the Sunrise Trading Post, will share his knowledge of Lenape foods, herbs and customs, showing and selling reproduction trade items and Native American crafts. Historic New Bridge Landing is located at 1201-1209 Main Street, River Edge, NJ. Suggested donation: $7 adult, $5 children, BCHS members free. For more information, call 201-343-9492 or visit www.bergencountyhistory.org. In commemoration of National Medal of Honor Day, the Historical Society of Plainfield will host a gallery talk on Sunday at 2:30 pm about Congressional Medal of Honor winners Julian Scott and James Madison Drake. Both men received their medals for service during the Civil War, and both have an association with the Drake House Museum in Plainfield. Julian Scott was an artist who, after the Civil War, settled in Plainfield and had a studio in the Babcock building. Five of his paintings are on exhibit in the Harberger Library in the Drake House. James Madison Drake was a descendant of Nathaniel Drake, whose home is now the Drake House Museum. Last year the County of Union commemorated both Julian Scott and James Madison Drake along with other Union County residents on a memorial stone, which is located outside the Union County Courthouse. The County of Union recently donated Julian Scott's and James Madison Drake's biography boards to the Historical Society of Plainfield. The boards will be on display in the second floor ballroom of the Drake House Museum. The public is invited to attend the gallery talk presented by Historical Society of Plainfield trustee Nancy Piwowar. The men's stories are interesting pieces of local history that had a national impact. Julian Scott became a Civil War artist and later worked as a census taker of Native Americans for the US government. James Madison Drake was a prisoner of war held in Libby Prison, Richmond, Virginia; he escaped from the Confederates by jumping off a train in Georgia and walking through the Carolinas to the Union Lines in Tennessee. The talk will take place in the second floor ballroom of the Drake House Museum. Refreshments will be served. All are welcome during regular tour hours (2:00 - 4:00 pm on Sundays) or by appointment. For more information, call 908-755-5831 or visit www.drakehouseplainfieldnj.org. Visitors to Bedminster's historic Jacobus Vanderveer House can get a firsthand look at life during the American Revolution during a free open house on Sunday from 1:00 - 4:00 pm. The circa 1772 Dutch Colonial home was once the headquarters of General Henry Knox while he presided over the nearby Pluckemin Artillery Cantonment established by the Continental Army during 1778-1779. Visitors to the house will have an opportunity to view a new 3D visualization of the Pluckemin Artillery Cantonment recently commissioned by the Friends of the Jacobus Vanderveer House, as well as authentic artifacts from the Vanderveer House, period rooms, the Prich Matthews History Center, paintings by John Phillip Osborne and John Ward Dunsmore, maps and other objects representative of Colonial life. The Jacobus Vanderveer House is located at 3055 River Road (in Bedminster's River Road Park), Bedminster, NJ. For more information, call 908-396-6053 or visit www.jvanderveerhouse.org.